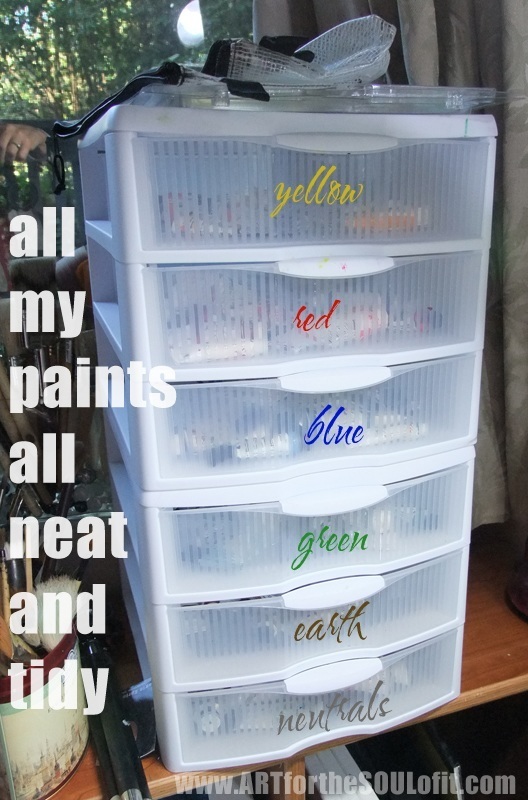 Organize All Those Paint Tubes – easy! I started out years ago using watercolors, bought way tooo many, and after i switched to buying real gouache (as opposed to using watercolor paint with white gouache) i ended up with two big shoeboxes full of watercolor tubes. I finally hauled them down and merged my gouache with all the old watercolor tubes, and threw them in their designated drawers. One of the funnest things I’ve been doing lately, is just blindly reaching in each drawer and grabbing a color, and whatever i pick, well…that’s what i paint with. It’s been challenging, fun and inspirational. i love a good challenge. Share with me your organizing ideas…would love to SEE and HEAR about them. Oh yeah, bought these plastic drawers at Target. Not earth-friendly but I plan on keeping them, like….forever!